"Good soup for cold day." Heat a Dutch oven or large skillet over medium-high heat. Cook and stir sausage in the Dutch oven until browned and crumbly, 5 to 7 minutes; drain and discard grease. Add onion and garlic; cook and stir until onion is tender, 5 to 10 minutes. Stir chicken broth, tomatoes, carrots, celery, ketchup, and red wine into sausage mixture; bring to a boil. Reduce heat, cover, and simmer until carrots and celery are tender, about 30 minutes. 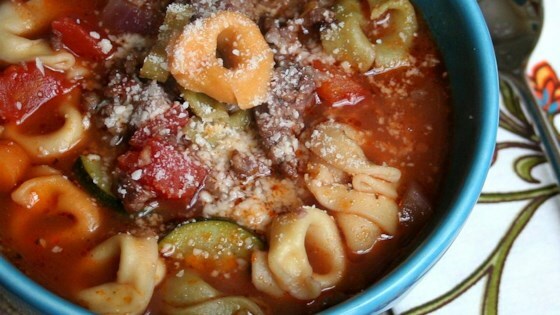 Add tortellini and zucchini to the soup and cover; simmer until zucchini are tender, 25 to 30 more minutes. Ladle soup into serving bowls and top with Parmesan cheese. It was sweet. Too sweet! Very good! I thought the ketchup,was a strange ingredient but it was fabulous! Wow! This was delicious! We made it without the sausage. It is so flavorful. Kids loved it too! Added extra broth and crushed tomatoes as the tortellini absorbs so much liquid. I followed the recommendations of other reviewers, and used less ketchup. Also on someone's advice, I added chopped spinach at the last minute. We did like it a lot. People, when you use tomato paste, make sure you use a little sugar, it balances out the flavors.